Need more information about booking Home 375702 ? Turn right at the evergreen oak and follow the leafy lane to the river. Here, on the banks of a gently flowing stream, is a secluded retreat: a dinky stone barn surrounded by neat patios and green lawns. A lavender-fringed path winds down to a stone bench at the edge of the garden jutting out into the stream. Sit and dangle toes in the water and spot trout and heron; you may even catch the iridescent blue flashes of the kingfisher darting across the water. You enter through a vintage oak door into a stunning living/kitchen area that reaches up to the apex. The walls are white, the floors stripped oak, Tony and Ann have splashed their creative flourishes all over: fresh yellow bar stalls at the kitchen island, a medieval chair with stage lighting, a porthole window on the landing and a large wood burner in the corner. The beautiful kitchen at the far end sits under a chunky horizontal beam. The double room downstairs has a Victorian bedstead. Open the velux in the twin room upstairs for a view of Glastonbury Tor. A peaceful hideaway where the sound of chirruping starlings and babbling water break the silence. The village of Keinton Mandeville has a well stocked village shop, one pub and two farm shops all in walking distance. There are plenty of pubs serving good food close to The Mill Barn. The old market towns of Castle Cary, Somerton, Wells and Sherborne are near by and many lovely walks and bike rides to enjoy in the area. 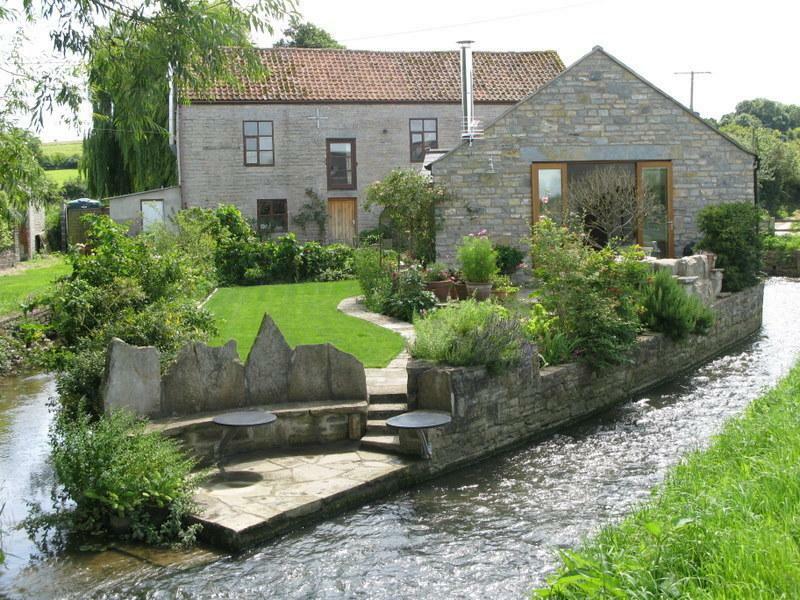 The Mill Barn is in close proximity to most attraction in central Somerset such as Glastonbury Abbey & Tor, Wells Cathedral, Cheddar Gorge and The National Trust properties Montecute House, Lytes Cary Manor and Stourhead. Fleet Air Arm Museum, Haynes Motor museum and Clarks Village factory outlet are great options for rainy days. This Barn has 2 bedrooms, 1 bathroom and sleeps 4. It’s been listed on Holiday Lettings since 02 Apr 2013. Located in Glastonbury, it has 38 reviews with an overall rating of 5. The average weekly rate varies from £831 to £916. Stunning, extraordinary and tranquillity at it's best. Well, you look at the pictures and think, wow, can this be real? In reality... it's even better! The Mill Barn is spotlessly clean and maintained to the highest standards, the living/ dining room with kitchen is and feels so incredible huge. Both bedrooms are very spacious and the bright bathroom with lots of towels has a large walk-in shower. Just unique, I wish I had one of these at my flat, so comfortable. The outside area is as well as seen on the pictures, only the hedges are taller, therefore your feeling of privacy is even higher. We would definitely recommend a stay here. There are lots of nice towns to visit only a short drive away (Wells, Glastonbury, Bath and Street with the outlet stores), lots of walks in the vicinity (one passes right next to the Mill Barn) and some pubs with very good food not to far away. And don't forget to put in an extra, hopefully sunny day to just stay in your private garden and let the world go by. Thanks again to Ann and Tony for your warm welcome and for letting us stay in this gem of yours, we hope to see you again in the sooner future. My wife and I, with our two teenagers have stayed in the Mill Barn for 3 consecutive summer holidays. We just have to come back. It is like a privat retreat in a luxury cottage tucked away in the beautiful english countryside. The barn is spotlessly clean and has beautiful furniture and fittings.The garden is quiet and tranquil, and the water running through the canals on either side of the cottage and the surrounding garden add to the feeling of being close to the elements. We enjoy to take walks through the apple orchard and on the many lovely public footpaths that are nearby. Ann and Tony are warm friendly people, who welcome you from the heart, and make you feel at home straight away. We will be back again next year, and are looking forward to it. We spent 4 wonderful days at the Millbarn. The place is beautifully furnished and we were supplied with items for breakfast. On arrival and departure we were met by Ann and she was a really wonderful hostess. This little peaceful piece of paradise was just what we needed to relax and rejuvenate. Glastonbury and stonehenge were not too far away. The wifi was really good as well. The Millbarn will definetly be our first choice for the next trip the UK. I stayed here with with my daughter and two young grandchildren for what was a perfect week. We were blessed with wonderful weather but had that not been the case we would have still had a memorable time. The cottage is ideally placed for visits near or further afield and is such a pleasure to return home to. Ann and Tony have thought of absolutely everything and are charming and generous hosts. I have stayed in many self-catering properties but The Mill Barn has claimed the top spot as my favourite. I intend to return one day. We had a great five night stay at Mill Barn. The property is in a wonderful, quiet rural location but only a 10 minute walk to a decent pub, serving good home cooked food. Mill Barn is beautifully and tastefully decorated to a high standard with great attention to detail. The lounge is modern, spacious and homely. You can see where they have used some of the wood from the original barn and the use of wood and granite throughout is a great look. The kitchen area is well set out and really well equipped. The bathroom was extremely clean with plenty of hot water when needed, a great power shower and some nice smelling products for use. The garden is another wonderful, tranquil spot with a running stream by which you can sit on stone carved seats and relax or dine out on the secluded patio table and chairs. There were lots of maps, books, games, CDs and DVDs. The owners are friendly, always happy to help but totally unobtrusive. This is simply one of the best rentals we have stayed in, out of many, and comes highly recommended. Beautiful location with river on both sides. Facilities are excellent and with real character. Well equipped with many new features. A twin bedded room upstairs for the kids and a double bedroom downstairs next to the main bathroom.